Kruger National Park airport in Skukuza is the prettiest tiny airport I’ve seen. The architecture is very authentic African style but has all the features of a modern airport. Arriving at Kruger National Park Airport in the tiny plane from Johannesburg to Skukuza. We arrived at Kruger National Park after a layover in Istanbul for dinner, a nice breakfast in the Paris airport lounge and a terribly chaotic transfer in Johannesburg. I had expected it to be a just a tiny landing airplane strip like in Masai Mara National Park. But it turned out to be a memorably beautiful airport. We arrived at Skukuza, a Kruger National airport after over 30 hours of flights and layovers. The crisp winter morning felt instantly refreshing. First things first, we need to get the Kruger day pass at the arrival entrance of Kruger National Park airport in Skukuza. One can’t leave the airport without it. 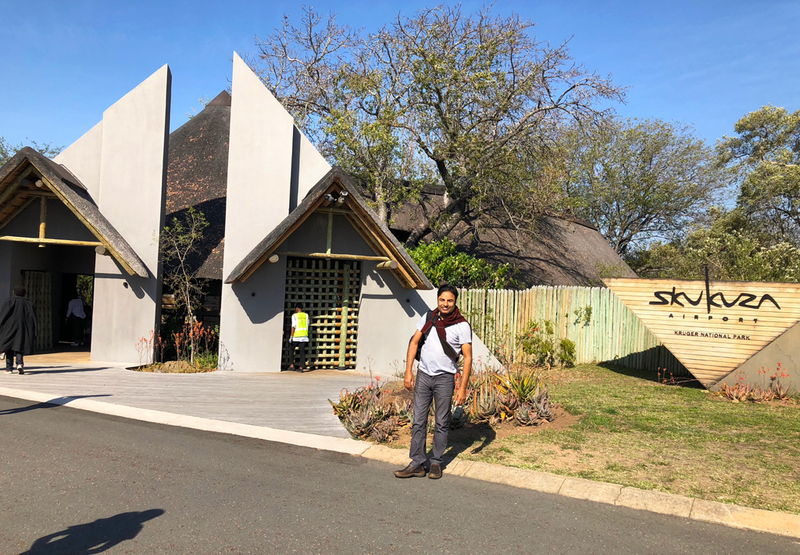 We had bought the Kruger National Park tickets on the website, starting the following day, as we had planned to relax at the resort after the extremely long travel. So when we arrived at the Skukuza Airport, we didn’t think of going to the conservation desk. After getting the baggage and the seemingly long wait for our rental SUV to arrive, as we were finally leaving the airport, we got stopped at the exit. The guard couldn’t let us into the Kruger National Park without a ticket. Since we had landed in Skukuza airport inside the national park, there was no other way out. So, we returned and got the ticket. It probably took an entire 5 minutes to sort it out! Thanks to the tiny and by then completely empty airport. Welcome to the most beautiful and authentically African Airport’s main area. Kruger National Park airport in Skukuza is circular with offices and stores around the circumference and a sitting area in the middle. The Skukuza Airport check-in desk looks more like a hotel registration desk than an airline check-in desk. In all likelihood, the most convenient car rental office is in the Kruger National Park airport in Skukuza. The pretty Skukuza Airport’s gift shop is not just a National Park supply store with bug repellents and khaki clothing. It’s lined with African art and stylish jewelry and clothing. Even the restrooms in Kruger National Park Airport in Skukuza are designer. The departure lounge in Skukuza looks more like an outdoor cafe where one can see the airplanes landing and taking off without even a glass barrier. We did not leave from this airport, so we never got to see it up close. The Kruger National Park Airport at Skukuza was very thoughtfully, built in 2014 and was a momentous occasion for South African tourism. Read all about the Skukuza airport layout and design. The main entrance of the Skukuza airport is right at the parking lot. To get to the baggage claim one would walk through this section guarded by the gient hippopotamus. The baggage claim is probably the most fascinating. It’s a small hut in the parking lot where passengers stand around. The airport staff lines the bags along the circle. In the airplane, I got into a conversation with a lady sitting behind me. She was arriving from London to meet her son and his family. Her son is in charge of Kruger’s fire management and her daughter-in-law is in charge of water conservation at Kruger. They live in the staff housing in Skukuza village, with all the amenities and wonders of a top National Park. They’re raising their children in a wonderful village around humans and animals and all the conservation efforts. They even have a little school for the staff in Skukuza. At the baggage claim, she introduced me to her adorable grandkids, a gorgeous mix of British white and African black genes. I got so into them that I didn’t notice the activity behind me. As I turned around my bags had disappeared. I thought my family took the bags to the rental car but no one was in sight. Wondering what could have happened to the bags, I walked around the parking lot in search of my family. Just to notice that a tour bus driver was loading my bags along with his tour group’s things! Luckily, I arrived on time to clear the confusion. I got the bags back and waited as the car rental office brought in the car from another location. In the meantime, I made friends with all the airport staff and the caretakers as I waited. I vote Kruger National Park Airport in Skukuza and the cutest and prettiest airport. Kruger Mpumalanga Airport is the other airport serving Kruger National Park area. This looks lovely and a nice way to enter Kruger NP. I visited back in 2011 and drove from Johannesburg. Visiting Kruger was one of the top moments of my life. I would love to bring up my children like the family you mentioned – what a wonderful childhood. I hope you enjoyed the rest of your trip. Hi Suzy, I love the idea of taking the family to Africa and re-living the experience with the kids. It’ll be amazing. We debated between driving from J’Burg, flying to Skukuza or one of the other airports. We had read reports of violence and car theft on the long drive so we decided to fly. It’s like a Boutique airport! I am heading their next year if all goes well but OH MY GOD, it’s expensive to fly to this airport. I think I will just from Joberg. That’s the right word, Arunima! It is a boutique airport. I just never heard ‘boutique’ with an airport until now. We changed there and had enough in just the transfer. I hope you’ll fall in love with Africa. This is indeed the most beautiful airport I have ever seen. 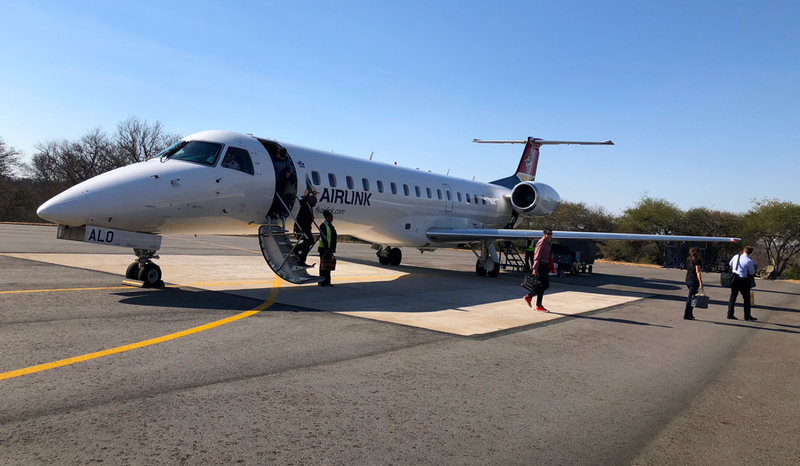 Okay, it isn’t as big as the airports I am used to, but I’d definitely going to travel to the Kruger National Park Airport just to see it with my own eyes! Hi Sanne, it’s certainly very small, and totally unique. Wow, it’s gorgeous! I went through 8 years ago, I don’t remember it being so fancy! You’re right Amy, it was made all over again very recently. It looks brand new – it fits the natural surrounding and yet very modern. Wow this is an amazing airport. I love the interior design and how it captures the culture of the people. Thank you for sharing! Hi Kelsey, it so evident that the put a lot of effort into designing the airport to naturally fit into the National park. I’ve been to this airport, our car stopped here on the way to where we were staying in Kruger. I only used the toilets and checked out some shops but I agree that it is such a stunning and unique airport. Great post! That’s a good idea because there aren’t too many restrooms in the park. Most people never go there. I think it’s a destination in it own right. What a cute and pretty airport..looks really cozy and amazing .wpuld love to be here.by the way you had a really long flight. Hi Madhu, Skukuza is certainly a charming airport to land at. All the fatigue melts away before starting the amazing wildlife viewing of Kruger National park begins. I want to go to Kruger just so I can see the airport 🙂 I’m hoping for a trip to Africa soon. This is very helpful. Oh man, that is a cute little airport! I love airports where there’s a lot of exploration opportunities. These days I do a lot of lounges, but often bc the airports are no fun to be in! Totally Rowena! Skukuza airport is the cutest little airport and the location within Kruger National park makes it so convenient. I agree with the lounge decision. Especially in the busy airports like Istanbul. I had no idea you could fly directly into the national park! What an adorable airport, though. But bizarre that you can’t get into the park without a ticket despite technically being IN the airport. Just one of those fun idiosyncrasies! Glad you didn’t lose your bags! That would have been a headache. But I’ve never come across such a well made mini airport! I have never seen someone write a post dedicated to an airport, but I can see why you did! The baggage carousel is so cute, I think that would make it a much more fun experience if all airports had cool baggage carousels! Awww- that is cute! And how convenient to fly straight there. We’re hoping to visit Kruger next year- might have to try it!! That airport is impressive, you can tell it looks brand new. Good to know you need to get the pass before leaving and thank goodness you caught that tour guide before he ran off with your stuff! Very interesting indeed!! I am doing my dissertation about Sense of Place at the airports and I came across your blog after having decided to include Skukuza Airport as one of the examples on airports in Africa. I knew I wasn’t wrong!! Beautiful pics, I love them. Hi Claudia, I’m glad you included Skukuza airport in your research. They’ve definitely done an amazing job or making it true to its surroundings while incorporating all the modern creature comforts.